The Children’s Referendum vote, which took place on Satuday (10th November 2012), was passed on a lower than expected (but rather comfortable) margin of 615,731 votes (58.00%) to 445,863 (42.00%). This referendum vote had the third lowest ever turnout level of any referendum vote held since the foundation of the state (see Figure 1), with an overall national turnout level of 33.49% and turnouts levels as low as 23.81% and 24.47% being recorded in the constituencies of Donegal South-West and Donegal North-East, respectively. Following this contest, the average turnout level across all referendum contests held since the foundation of the state now stands at 52.11%. Was the low turnout down to holding this referendum on a Saturday? I would argue that was not the case, except maybe for certain places with high levels of residentially mobile populations who may tend to be elsewhere at the weekends (i.e. “home”, visiting family) other than their place of residence, and believe that the turnout level would have been even lower has this vote taken place on a Wednesday or a Thursday. Indeed it is worth noting that Ireland’s limited experience of Saturday voting (which, to date, has never been employed yet for a general or local election contest) has been one in which the Saturday voting brought about a notable improvement in turnout propensity. The clearest example of this relates to the two Nice Treaty referendum contests in the early 2000s. The first of these was held on a Thursday in 2001 and was associated with one of the lowest turnouts for a referendum vote in the history of the state (34.79%, the third lowest referendum turnout in the history of the state prior to last weekend’s vote). The second Nice Treaty vote took place little more than a year after the first referendum; this was held on a Saturday and the turnout for this (49.47%) was almost fifteen percent higher than that for the first referendum. The two Tipperary South by-elections held during this same period also adds further proof of a higher turnout effect for Saturday voting, albeit to a less dramatic degree. The first by-election was held on Thursday 22nd June 2000 and the turnout for this was 57.97%, while the second by-election, held on Saturday 30th June 2001, had a somewhat higher turnout level (58.50%) despite this probably having been a less competitive/lower profile contest than the first by-election, the level of voter fatigue that would have been expected and the fact that a general election was due to be held in less than a year. Evidence from political science literature and from other countries also supports the positive impact weekend voting has on turnout levels. Ultimately blaming Saturday voting for the low turnout at the weekend is akin to blaming the lifeboats for the sinking of the Titanic – in my opinion we could have been looking at a national turnout level in the mid-to-high 20s (in a similar vein to the 1979 Adoption/Seanad voting rights and 1996 Bail referenda) had the contest been held on a weekday as is usually the norm. 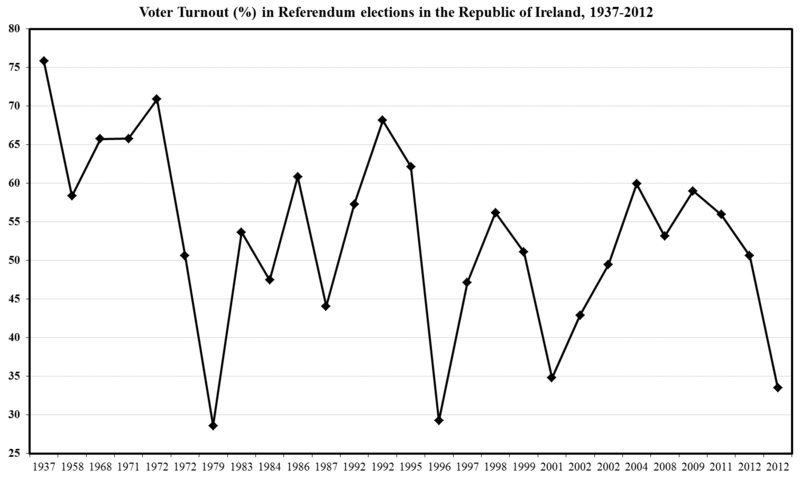 In geographical terms, the voting trends observed for this referendum contest are quite similar to those observed for recent referendum election contests, despite the fact that the issues invovled in this vote were very different to those of the recent, mainly EU focused, referendum contests (Figure 2). Turnouts again proved to be highest in the more middle class urban constituencies, with the highest turnout level at a constituency level being recorded in Dublin North-Central (42.03%), followed by Dun Laoghare (41.54%) and Dublin South (40.92%). 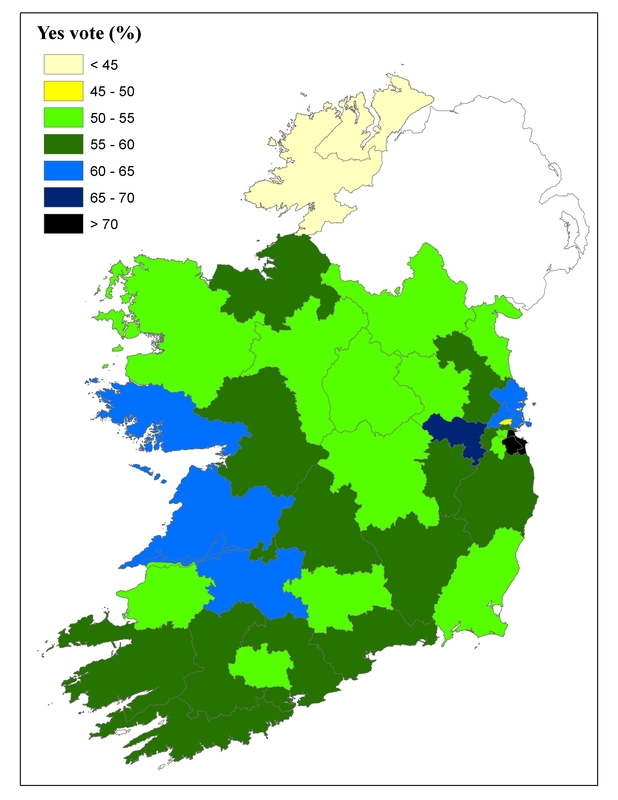 Outside of Dublin the higher turnout levels were found in the immediate Dublin commuter hinterland (the Wicklow and Kildare North constituency) while the highest rural turnout levels were associated with the counties of Tipperary and Cork. 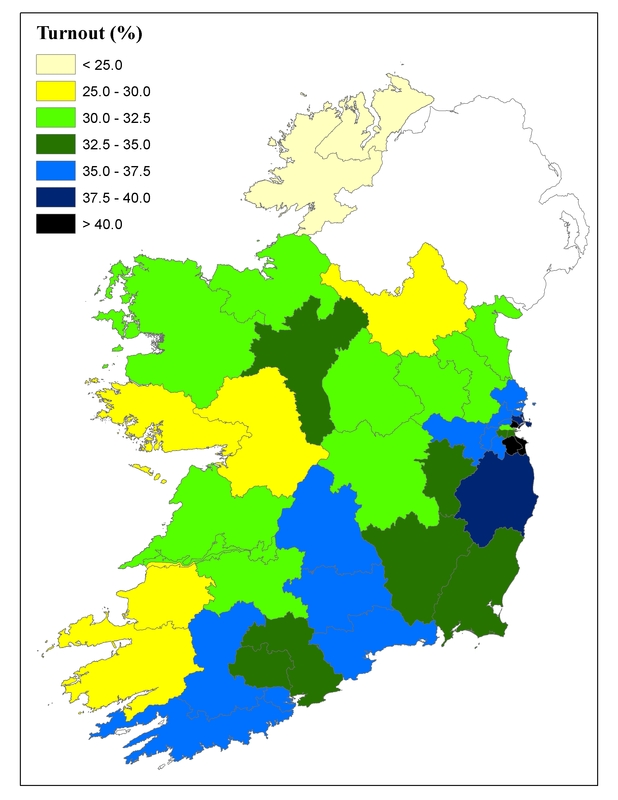 In keeping with the pattern for other referendum votes, the lowest turnout levels were again found in the Donegal constituencies (as noted above), with low turnout levels also being record in other border and western counties, such as Kerry, Galway and the Cavan-Monaghan constituency. In general, constituencies with higher turnout levels, such as the Dublin middle class constituencies, also tended to record the highest percentage Yes votes. The Yes vote exceeded seventy percent in three constituencies in this election, namely Dublin South (73.03%), Dublin South-East (71.87%) and Dun Laoghaire (71.57%). Overall, there was a highest support level for the Yes side in Dublin (62.40%) – as opposed to the rest of the state and especially the Ulster region, with support levels for the Yes side standing at 57.21% in Leinster, 58.87% in Munster and 53.87% in Connacht-Ulster (and 47.81% in Ulster) – but Dublin North-West (49.61%) stood amongst the small number of constituencies opting to vote against the proposed change to the constitution. The only other two constituencies to vote against the proposed change to the constitution were the two Donegal constituencies, with the highest No votes (in percentage terms) in the state being recorded in Donegal North-East (with 59.66% voting No) followed by Donegal South-West (56.47% voting No). This is in keeping with previous referendum votes, in which the highest levels of opposition to referendum proposals were recorded in the Donegal constituencies as well as the more working class Dublin constituencies. As such, even though Sinn Fein supported the proposed change to the constitution, there is an evident pattern here (as with the earlier EU Fiscal Stability Treaty referendum) in which the constituencies with the highest level of opposition to the referendum tends to be those also in which Sinn Fein currently polls the strongest in. This entry was posted in Election data, Electoral Geography (voting maps), Referendum elections, Voter turnout and tagged 2012, Donegal, referenda, Sinn Fein, voter turnout. Bookmark the permalink.